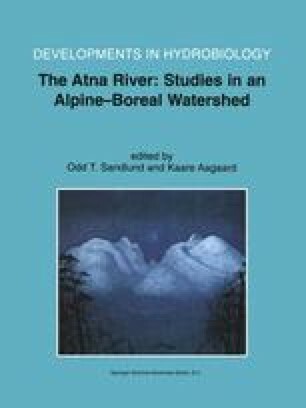 The objective of this study in River Atna, Norway, was to analyse the spatial and temporal variation in species composition and diversity of the periphyton community in a pristine sub-alpine / boreal watercourse. The variations in the biotic parameters were related to selected environmental factors. We addressed epilithic algae and species living epiphytic on epilithic algae and submerged bryophytes. The sampling sites were located in the alpine, northern boreal, and mid boreal biomes. There was considerable spatial variation in species composition and diversity. This variation showed close correlation with natural gradients in water temperature and nutrient concentration. Three or four periphyton community categories could be distinguished in terms of species composition, diversity, and environmental variables. At high altitudes (1150–740 m a.s.l.) in cold water temperatures and extremely low nutrient contents, there was very low species diversity, only including algae known from ultra oligothrophic cold waters, e.g. Scytonematopsis starmachii (cyanobacteria) and Klebshormidium rivulare (green algae). The second category, at medium altitudes (701-522 m a.s.l. ), was characterised by somewhat higher water temperatures and nutrient contents, and the species diversity was higher. This category included algae known from somewhat richer waters, e.g. Stigonema mamillosum (cyanobacteria) and Zygnema spp. (green algae). The third category was located at approx. 522 m a.s.l., had low water temperatures, relatively high alkalinity, and was characterised by Tolypothrix distorta (cyanobacteria) and Ulothrix zonata (green algae). A possible fourth category was found in the lower part of the river (350 m a.s.l. ), where periphyton was distinguished by high diversity. At the individual sampling localities, species diversity showed strong seasonal variation, but otherwise high temporal stability. Over the 12 years of observations, there was only a weak temporal trend; towards species initially occurring only at low altitudes and high nutrient content. The combination of high temporal stability and high spatial variability, correlating closely with environmental gradients, is the main reason why periphyton observations have become an important constituent in water quality assessment.